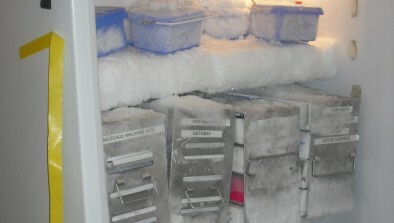 Keep your -80 freezers in top running condition. Step 1: Get your freezer cleaning set and suit up with gloves, brush and ice scraper. Step 2: Remove ice buildup. Start on the seal on and around doors, and then inside shelves. Step 3: Clean gaskets with a soft brush to maintain a good seal. Step 4: *Pro tip* Lay a chamois sheet on the floor to collect ice and water. Request a Free Freezer Cleaning Set for your Harvard affiliated lab, by contacting sustainability@hms.harvard.edu or energy@fas.harvard.edu.